Ever feel so overwhelmed -- or agitated -- that it's hard to think clearly? Whether it's relationship conflict, financial worries, fear, anxiety, or the stress of daily life, it's common for people under pressure to experience racing thoughts -- sometimes to an almost vertiginous degree. That state of confused thinking actually -- and paradoxically -- creates even more confusion, anxiety and stress. Thoughts spinning out of control feel a lot like life spinning out of control. Scattered Thinking? Make a list! but clarity of thought requires lists. 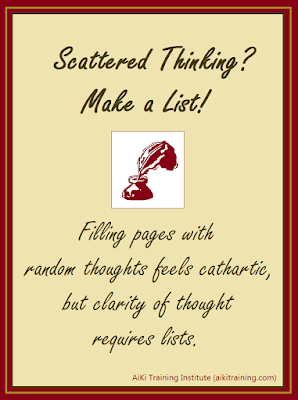 To resolve scattered, racing thoughts we offer a practical, mindful, quick fix: Make a list. Pulling out a sheet of paper (or opening a blank document) is a deliberate, conscious act that allows you to slow yourself down, and beginning a list prompts you to start organizing your thinking. We advocate mindfulness as a critical component of good mental health. Mindfulness improves your internal states, and produces subtle, positive mood, energy, and behavioral shifts. (1) As you mindfully create lists you begin to feel rational, calm, and confident. List-making is itself a creative act, focusing attention and stopping the mind from automatic, habitual patterns of agitated thinking. From this state it becomes possible to slow your breathing, observe yourself, calm your thinking, and stay in the moment. Bonus: Lists become to-do lists, and when things get done, you build your sense of accomplishment -- a big part of healthy self-esteem. (1) Miklowitz, D. J., Alatiq, Y., Goodwin, G. M., Geddes, J. R., Fennell, M. J. V., Dimidjian, S., Hauser, M., and Williams, J. M. G. (2009). "A Pilot Study of Mindfulness-Based Cognitive Therapy for Bipolar Disorder." International Journal of Cognitive Therapy, 2(4), 373–382.